Shandon is the area north of the River Lee, right in the center of Cork and well worth a trip across the North Channel by way of the Christy Ring Bridge. The Church of St Anne in Shandon on Shandon Street is home to the famous Shandon Bells, built in 1720's it is one of Cork's most famous landmarks. The design of the building consists of a square tower surmounted by a lantern, on top of the lantern is a copper dome with a gilded weather vane in the shape of a salmon. Two sides of the tower are made from red sandstone and the other two are made from limestone. The four-faced clock, made by James Mangan of Cork, was erected by Cork Corporation in 1847 and had been known as "The Four Faced Liar" ( also "The Four Liars") as the clocks never agreed. According to tourist guides this problem has been rectified but some of my photographs show that some of the clocks do not agree. The Cork Butter Museum is a unique institution, celebrating one of the great success stories of Ireland, the butter trade. Located in the historic Shandon area of Cork city, the story begins with the central role of dairy culture in the Island of Saints and Scholars. The Museum goes on to describe the internationally important Butter Exchange in nineteenth century Cork, the traditional craft of home butter making and the modern success of the Kerrygold brand. In the course of this story, the commercial, social, and domestic life of Ireland is recalled. The Firkin Crane building was designed by Sir John Benson and opened in 1855. The building is a unique rotunda, which formed part of Cork's original Butter Exchange. This building forms part of an interesting group of related structures with the former butter market buildings in the Shandon area. The butter trade originating from Cork City in the eighteenth and nineteenth centuries stretched to Great Britain, Europe, North America, the Caribbean, and the West Indies. Indeed the building's name derives from Danish words pertaining to measures of butter. Firkin is a Danish word meaning quarter barrel and in former times these firkins or casks were tarred and weighed on a balance known as a crane. The building is also of archaeological significance as it was constructed on the site of medieval Shandon Castle. This site was occupied by the Dominicans, who had a chapel and convent here from 1784 until 1840. When the Butter Market closed in 1924 James Daly and Sons occupied the building until the 1970’s when they moved their margarine manufacturing business to new premises. The building also housed a hat factory for a time. The Firkin Crane was completely destroyed by fire in 1982. It reopened in 1992 and is now a bustling centre for dance of all kinds. 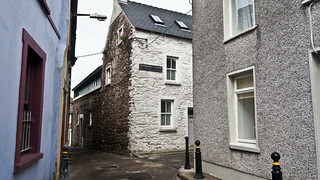 With four dance studios and two performance spaces, it is a unique building for dance in Ireland. Large scale performances run throughout the year along with a range of regular classes and workshops across a spectrum of dance styles. The Firkin Crane is a permanent base for Cork City Ballet, Crux Dance Theatre and equally home for all the professional and community dance artists in the area. The Cathedral of St. Mary and St. Anne, known locally as the North Chapel, is located at the top of Shandon Street, in one of the most historic areas of Cork. The Cathedral is the principal church of the diocese of Cork & Ross and is the place where major diocesan celebrations take place. The Cathedral was dedicated in 1808 and celebrated its bicentenary in 2008. The interior was rebuilt by George Richard Pain, in 1828 following a fire. The tower dates from 1862. John Hogan produced the apostles and the saints figures, and the bas relief, "Last Supper" as well as the Bishop Murphy mural monument. Turnerelli produced the bust of Bishop Moylan.